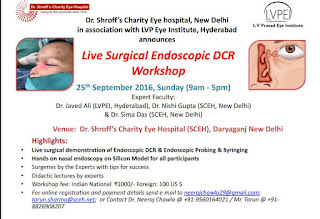 Otolaryngology Update: Live Surgical Endoscopic DCR Workshop and Personalised Endoscopic DCR Training, 25th & 26th September 2016, New Delhi"
Live Surgical Endoscopic DCR Workshop and Personalised Endoscopic DCR Training, 25th & 26th September 2016, New Delhi"
Department of ENT at Dr. Shroff’s Charity Eye hospital, New Delhi in association with LVP Eye Institute, Hyderabad announces our 2nd Live Surgery Endoscopic DCR workshop and our 1st Personalised Endoscopic DCR Training Workshop at the Department of ENT at Dr Shroff’s Charity Eye Hospital, New Delhi. Please find attached the details of the program. 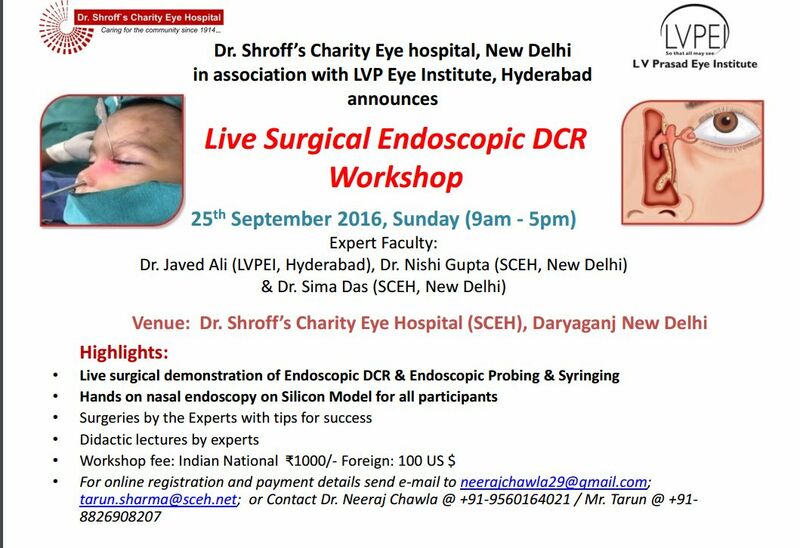 I trust this live surgical workshop will help both junior and senior ENT surgeons to enhance their skills and improve their outcomes in DCR surgery.